Data from the U.S. Census Bureau show that there are 76.4 million baby boomers. Representing nearly one quarter of the U.S. population, these people born between 1946 and 1964 are accustomed to, shall we say, the finer things in life. And some of those finer things are their own teeth! So, if they should happen to need tooth replacement, then dentures simply will not suffice. They will expect a more lifelike alternative and fortunately there is one: dental implants. Dr. Steve Koo at Piney Point Oral and Maxillofacial Surgery is the oral surgeon Houston, TX, residents depend on to perform competent and professional dental implant surgery. According to the American Association of Oral and Maxillofacial Surgeons, some 69 percent of adults between the ages of 35 and 44 have lost at least one tooth because of an injury, root canal failure, periodontitis or severe tooth decay. (And they’re not even baby boomers!) By the age of 74, more than a quarter of adults can expect to lose all of their teeth. A dental implant is the most lifelike tooth replacement option because it replaces both the root and crown of a missing tooth. First, Dr. Koo surgically implants a titanium post in the jawbone. As you heal from surgery, the post and surrounding bone tissue fuse together, forming a strong and stable foundation. Then, a qualified restorative dentist will attach a custom-fitted crown to the post. The finished product is much like a natural tooth in both form and function. 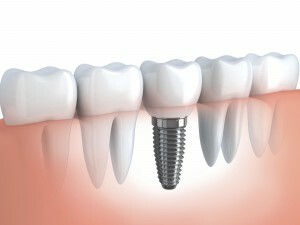 Whether you are a baby boomer or not, you should consider dental implants for your tooth replacement needs. Dr. Koo and his staff at Piney Point Oral & Maxillofacial Surgery would be glad to consult and offer more information about implants. We conveniently serve patients throughout Houston, TX, as well as the surrounding communities of Stafford, Meyerland, Bellaire, Lamar Terrace, Galleria, Briargrove, Rice Military, Heights, Bunker Hill Village, Hunters Creek Village, Hedwig Village, and Katy, TX.